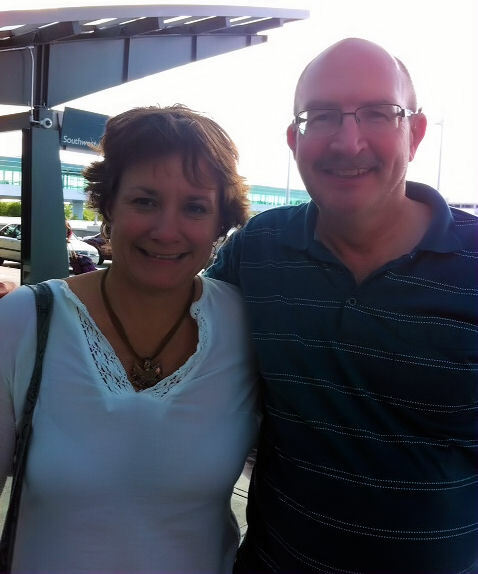 My first hearing loop experience was at the Hearing Loss Association of America (HLAA) convention in Rhode Island last year. At my first workshop, one of the coordinators announced that each workshop was looped so be sure to turn on our T-coils. Excited to try this technology I’ve only heard about, I turned mine on. It took less than five minutes to be totally amazed. I heard so well, I felt like a hearing person for the first time in years, watching the speaker instead of the CART screen. The clarity through the loop was a hundred times better than using an FM system. As a bonus, I heard through my hearing aids alone instead of borrowed earphones or neck loop wondering where they were last and were they cleaned and sanitized? This time I simply pushed a button on my hearing aid and I heard. Why wasn’t there more of this available in America? 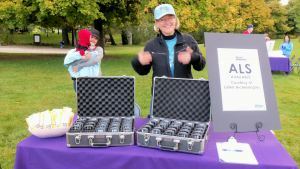 Kristen from Listen Tech pictured here with the ALD’s they handed out at the Walk4Hearing in Salt Lake City. 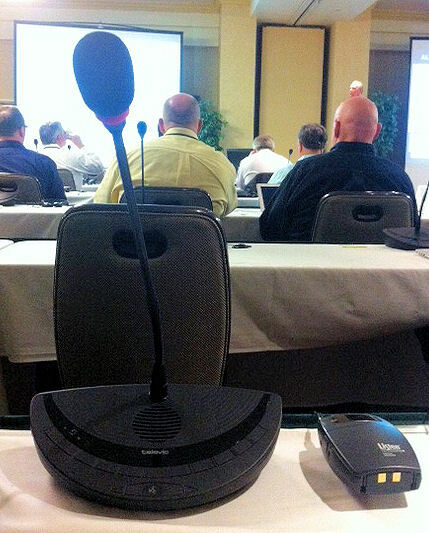 A few weeks ago, Listen Tech held a convention for their distributors. 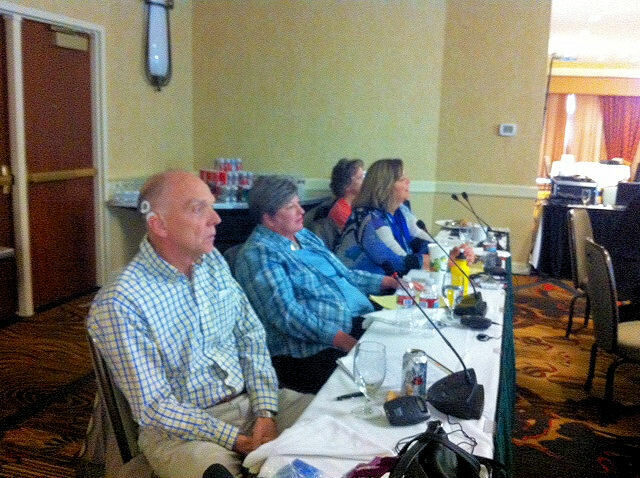 They invited some of us from the hearing loss community to come to their hearing loop workshop portion. 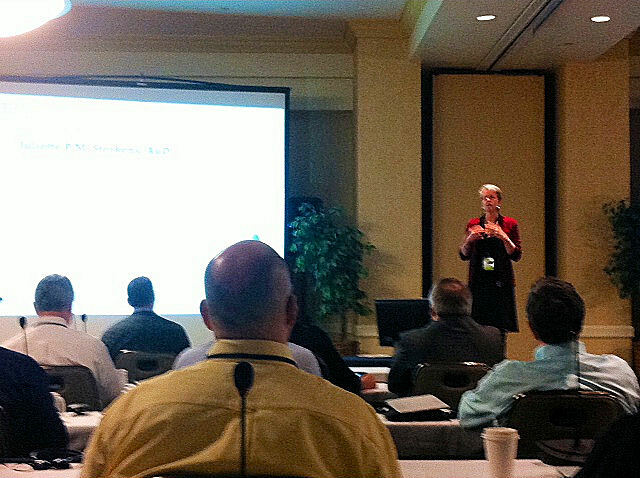 Juliette Sterkens, AuD from Wisconsin spoke first and she gave the best presentation on hearing loss I’ve heard. She talked about who is losing their hearing and why. She explained audiograms. She talked about high frequency hearing loss (the most common type) and what’s it like; how we hear vowels better than consonants and how our mind struggles to fill in the missing pieces. She went on to explain that hearing aids work best within a four foot range picking up the closest and loudest sounds like coughing, papers rustling, babies crying. 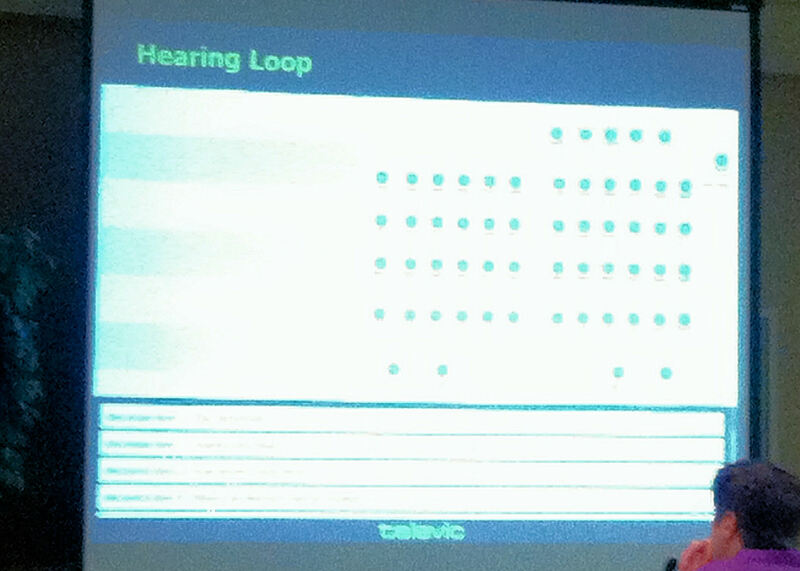 The speaker twenty feet away is lost in the noise that surrounds the hearing aid user, unless using the loop. The loop brings the speaker right to the ears and cutting out surrounding noise. Five of us who were hard of hearing sat in the back of the workshop at a looped table where it was impossible to lip read… and we all heard every word Juliette said without the benefit of CART. Normally in this kind of situation, I have to arrive early and make the presenter aware of my hearing loss. I ask them to wear my FM system and face me as much as possible because I use lip reading too. I stake out my position up front and in the center where I still very much struggle to hear. After two hours, I’m exhausted mentally and physically. Here, Juliette talked for almost two hours and I felt no fatigue at all. Our view of Juliette from the back of the room. The microphones in front of each seat. The first half of the seminar was about hearing loss. The second half was the technology side of hearing loops and were invited to stay. 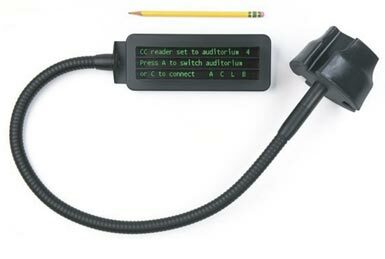 I’m not a techie but I’ll give it a go… A loop system consists of an audio source, a loop driver and wiring. Cables or loops are laid around the room according to size and specifications creating a magnetic field which hearing T-coils pick up. It brings sound direct to the ear eliminating audio distance. There are various choices of loop drivers and different ways to layout the wires according to the needs. As I understand it, past looping systems, which started in the 70’s, had lots of problems which turned off both the users and the people who bought them. Today’s technology has improved by leaps and bounds. Qualified installers are able to get beyond the biggest problems which are over spill and metal interference. Over spill happens when one loop system spills over into another looped room but this can be eliminated with different wiring and layouts. I didn’t understand how they get around metal interference but they do with various techniques. They showed us 6 different layouts and discussed common pitfalls and fixes. All I know is the loop systems I’ve experienced in this last year have delivered terrific sound. 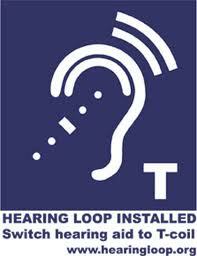 Turn on the t-coil in your hearing aid and give it a try. (Signs are required by the ADA.) Many tourist sites and tours in Europe are looped and it’s gaining popularity here in the USA. Recently the New York subway system was looped in certain places and a taxi company in NY will be looping their cabs soon. Quiet a few churches are getting loops here too as well some colleges, auditoriums and senior centers. Many people are getting their living rooms looped for a higher quality television sound too. How about some places we’d like to see looped: drive thru speakers, bank windows, theaters and meeting rooms. It’s a world of possibilities. At the end of the workshop with Juliette and Kristin in the back and middle of the row. That’s me in the brown in the back row too. So he turned up my hearing aids a bit. He told me he only turned them up a tiny bit but it sure seems like a lot to me. I spend a lot of time in my noisy environment program. I can hear my cat meow a lot more. He is a talker! I even heard him from behind me while we were driving down the road. (He stays with my mom when I’m gone for an extended time.) It’s nice to hear him. I mostly lip read my cat before this current audiologist reprogrammed my hearing aids. I think I hear more birds too. I’m at the city library now and I’m amazed at all the noise in here, even in my less volume noise program. Aren’t libraries supposed to be quiet? I had to ask my mom to not talk as loud as she normally does. When I take my hearing aids out, I really do feel nearly deaf. I’m shocked each time how little I do hear even though in a way the quiet is welcome. I asked my audiologist to make me a note for Motor Vehicle Division here to add to my driver’s license, a note saying I’m hard of hearing since the MVD won’t take my word for it. This way, if I’m ever pulled over or in an accident, the police or emergency people know what to expect. He was happy to write one up for me and put in it I have a moderate to profound hearing loss. I do? I didn’t know I was that bad. I thought it was mild to profound. This makes me wonder at how well I do in the world. I feel like I get along fine but how much struggle do I put into hearing without knowing it? I attended a small SayWhatClub gathering in 1998, about 30 of us camped out in Rocky Mountain National Park. No one felt left out of conversations, everyone was included even it took 5 repeats. We hiked, toured the country and hung out late around the campfire. I left feeling happy, super glad I went to spent time with others who are hard of hearing like me. 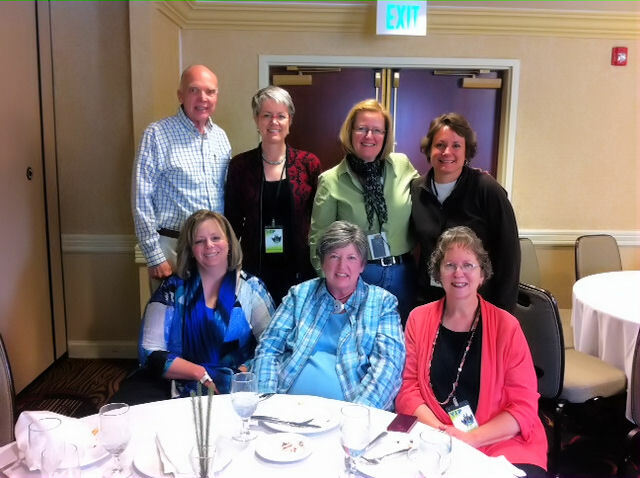 Two weeks ago, I went to the Hearing Loss Association of America’s convention in Rhode Island. I left Salt Lake with smile on my face knowing it would be ‘my world’ there. I had two roommates, one I found on the message boards and the other found me through someone I know in the SWC. Laura came from Massachusetts and Robin from Colorado and we were all three in 40’s which we didn’t realize until we met. We hung out on the edge of our beds, talking like girls at slumber party until late. Laura is hard of hearing with only one hearing aid right now, waiting for money to buy another. She’s mellow and a calming influence, easy to hang out with. Robin is basically deaf, hearing only enough noise with her hearing aids to make her look up but is the most excellent lip reader I have ever come across. If she’s looking at someone, she comes across totally hearing. It’s amazing and she shrugs off admitting she’s one of the few. She grew up oral not allowed to sign. Before I left Salt Lake, I set my phone with times and places of each workshop I wanted to attend and forgot about it. When I looked at my schedule Thursday morning, I thought things were off somewhat but couldn’t be sure without a program book and access to all my email. I poked my head into a research workshop I signed up for thinking maybe I was half an hour late and found out I missed the whole thing! I spent half an hour with them and went out to take a closer look at my phone/calendar. Oh man, there’s a button to push to change time zones for each event I enter into it. I showed the research event for Denver time. So I sat down with my phone and switched all the other events to New York time. Mostly I attended workshops around building our local chapter. Thursday afternoon was all about harnessing group dynamics with a two-part workshop. Before the actual workshop started, a lady reminded us to turn on our T-coil because the rooms are looped. I did and WOW!!! I never experienced it before this and I was totally amazed at the clarity of sound coming through my hearing aids at the push of the button. I heard so well, I hardly needed CART (it’s also helpful the that the presenter was male). I’m all for loop technology now and wish it was in more places in the U.S. It’s all over Europe but we are slow getting it going here. Anyway, he presenter made the class a lot of fun and I left feeling high on life. Next came the Presidents reception where I met two SWC people in person I never had before but they each had a group around them and I guess I didn’t want to intrude. I felt a little awkward there, sipping wine, wandering around, chatting to people I didn’t know. Before I left, I wanted to thank someone for all his help during our first Walk4Hearing here and he introduced me to a dynamic lady who is working with 6 Walks in the north-east. I got so many wonderful ideas from her to share with my group here. That was one of my best contacts made while there. When the reception was over I wandered to Meet and Greet sponsored by Caption Call, from the Salt Lake area. Feeling good about being there, making connections. I walk by a guy making balloon hats and I gotta have a balloon hat, not just a regular hat, it had to be a great hat I explained to the artist. After getting the hat, I saw someone I knew from Caption Call and she took a picture. 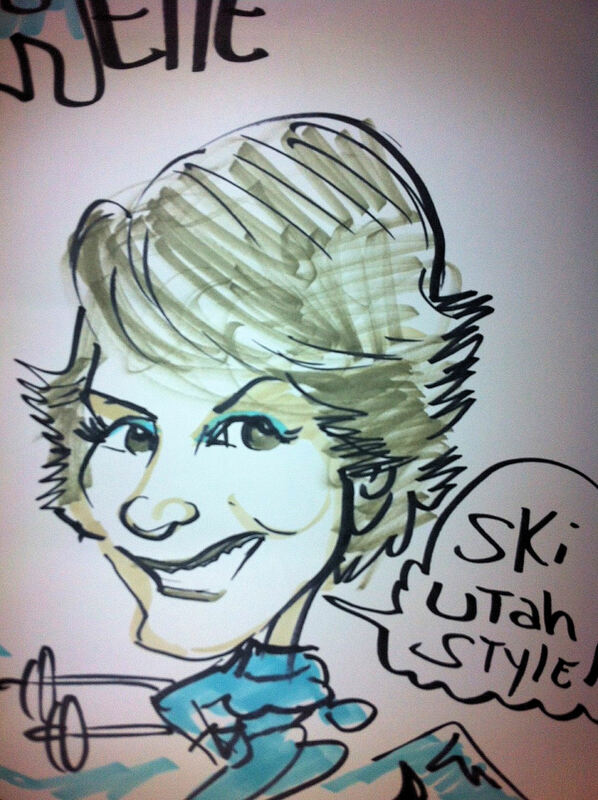 Then I saw Laura and we wandered over to the tables with 3 caricature artists at work. 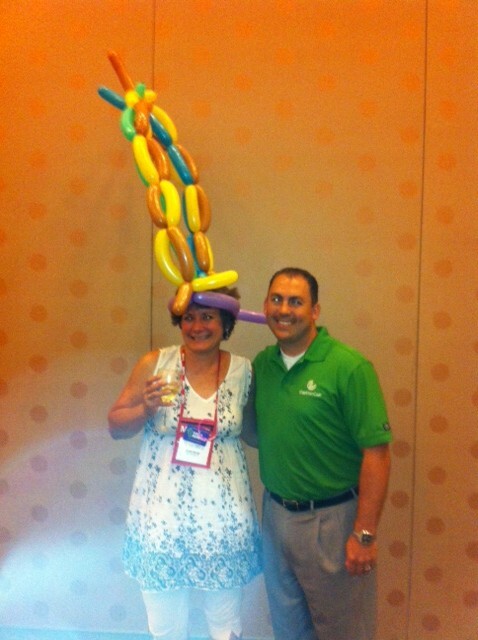 He wanted the balloon hat off. I put my hat back on started to mingle. I met so many neat people and I have such a hard time remembering names. I wound hanging around a guy who’s been coming to these things for 15 years. He kept introducing me to people so by this time, faces started to blend together. John’s another great person, born basically deaf, growing up in the oral world (but doesn’t lip read like Robin) and learning sign later. He has two cochlear implants and loves techno music for the beat. The next night I joined his group for dinner and he introduced to me two more neat people, Nini and Elenore there with their families. They were hard of hearing and signed as they talked. It’s an additional tool to use they said. At first I felt a little intimated around them as they signed but as I relaxed I started picking up some of the sign and even using some of it myself. What I didn’t get verbally, I sometimes caught in sign. How wonderful to be around people like that. I soaked it up. There were more workshops with loops and CART, more lunches and dinners with more people to meet. I couldn’t get enough of it, staying up late with everyone but being an early riser made for very little sleep. 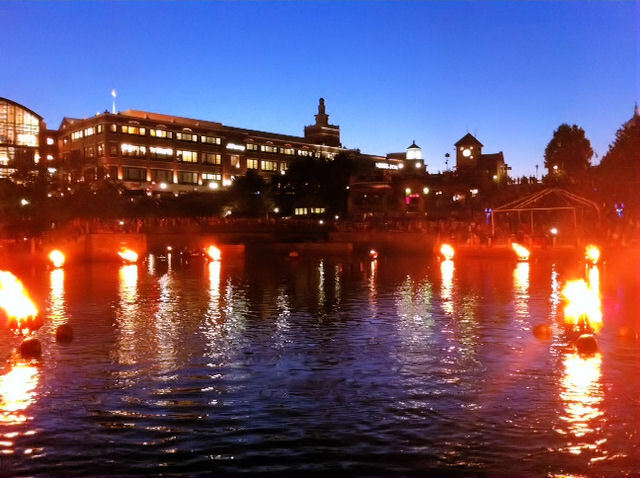 The city of Providence puts on a weekend show on the river called Firewater. 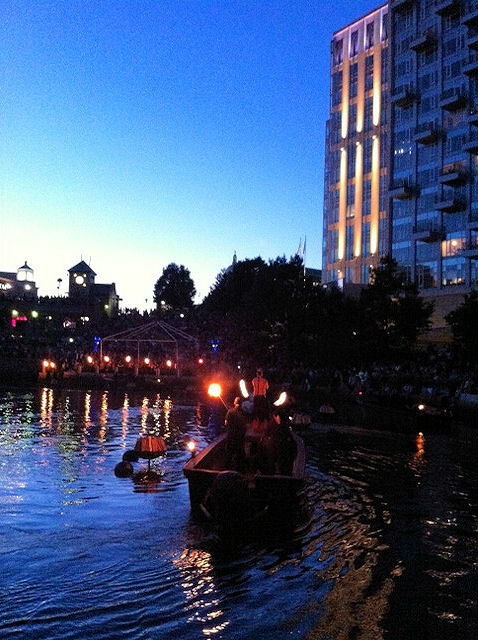 They have steel bowls anchored into the river, load the bowls with wood and boats go around lighting the fires with ceremony and music. Complete with a fire spinner. Most of the people around me hadn’t seen this type of thing before but me being an experienced Burning Man person had. I bet the guy spinning in front of the boat (not the best of pictures, sorry) is a burner. There were some oh’s and ah’s as the guy spun some steel wool. And that was my last night there. I don’t think I went to sleep until after 3 a.m. I met more neat people that night. Of course I woke up early. I attended the morning awards breakfast to watch a local friend of mine receive a distinctive award for all the advocating she does. I also got a token award for working with the Walk4Hearing. The event came down fast after that. 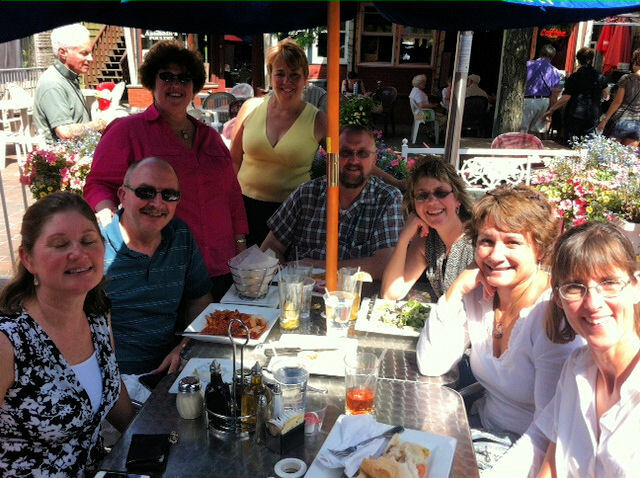 A handful of us stayed, talking in the convention center until we decided to go to one last lunch together. I’m in the middle on the right with Robin the most excellent lip reader sitting in front of me. John with the two CI’s is sitting almost across from me. We sat there right up until the time I had to go to the airport, thank goodness I made for a later flight. My original plans were to see Rhode Island that afternoon, to explore the area since I’d never been there before. That never happened and I don’t regret it either. It was much better hanging out with people who understand my world, who are part of my world. John had his car with him so he drove me to the airport. I got on the plane thinking my time had ended. I settled in while people continued to file in. I look up and there’s one of the SWC people I didn’t get to talk to much. I waved Debbie over and she sat in the seat next to me. We talked all the way to Chicago, convention bonus time. I enjoyed the time spent with her, getting to know each other and it was the perfect way to end it all. Once in Chicago, we had different flights to catch. What and awesome world it was. The SWC convention will be here in Salt Lake next month. I helped arrange bits of it. There will be 50 of us instead of 600 + but it will be all the same sort of affair; workshops with loops and CART, people I’ve met including Debbie on the plane and more neat people to meet. There will be late nights, lots of noise (good noise) and more learning. I came home sort of high, super tired and, I admit, a little cranky about having to come back the hearing world. Thank goodness for the Sanderson Center where I get small slices of the above. I think I could be addicted to these conventions. I can’t attend the ALDA convention this year but next year it will be New Mexico. 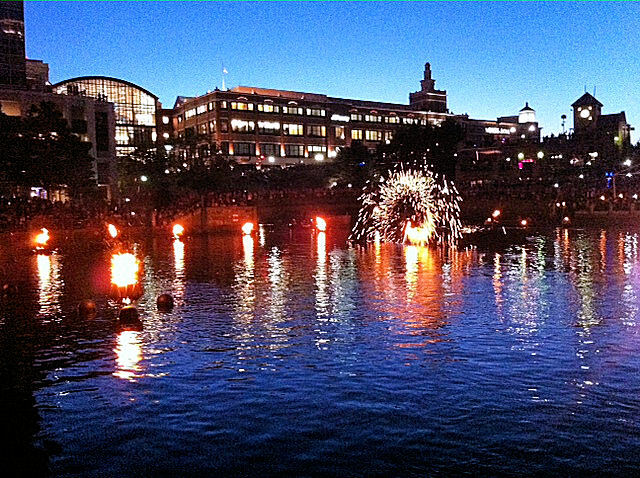 Next years HLAA convention is in Portland. I will do my best to get to both, getting as much of ‘my world’ in as I can. A few weeks ago I went back to the theater to watch The Rum Diary on it’s opening weekend. Nothing, no captions. People were talking and my CaptiView only said it was ready. I went out to inform the people in the ticket office. They sent a manager to me who said to wait there and she would be right back. I paced the hallway for 10 minutes with my CaptiView in hand when another manager giving an interview at one end came to me and asked me what the problem was. He said he would be right back. I paced the hallway for another 10 minutes when I saw captions light up. I missed twenty minutes but figured I would catch up. Not. It was the wrong captions and didn’t match the movie. Maybe the device searched automatically after so much time until it found captions? Near tears with frustration, my boyfriend and I left the theater room. A guy standing just outside the doors handed me two free passes and apologized. They couldn’t get the captions to work this time so they gave me my money back too. It sort of made up for the sheer irritation of it all but I would have rather have seen the movie with captions. Yesterday I went back again, with my free passes, to see the movie, Tower Heist. Surely, it would work all right since it wasn’t a brand new movie. We sat there I waited with tension through the previews. The movie started and nothing again! Damn it! I went out right away to inform management. They said they would be right back, har har. I paced a different hallway, looking at my CaptiView and nothing. I resumed pacing and the manager snuck up behind me and tapped my shoulder making me jump. She said, “It shows it working fine up there.” I looked at mine and it was displaying the captions now. I let her know I was tired of missing the beginning of movies and she patted my shoulder as I went into the theater again. The must have pushed the reset button I read about in another review of the device. All Cinemarks are switching to digital format, I believe, and will have CaptiViews available. Other theater companies will follow so I encourage all hard of hearing people to go forth and watch a movie. Go to the theater, inquire and let’s make our presence known. John Waldo has done a lot of advocating for us so don’t let these new opportunities go by, claim them. I’m going to be a thorn in their side until they get it right. I belong to one of 7 writing groups through our local community college. Today is their 10 Anniversary Celebration. There’s lots of writing activities going throughout the day and tonight around 6 they are having one person from each writing group give a 5 minute reading. My group asked me to represent them. Hearing aids aren’t called hearing miracles for a reason. Hearing aids help but they can’t reproduce true hearing. Technology is making advances but there is no cure for hearing loss. Those of us who wear hearing aids learn their limits but some hearing people around us seem to think once we pop our hearing aids in, we will understand everything. I’m here to tell you, even with our aids in we are still hard of hearing. Sensorineural hearing loss, also called nerve deafness, is the most common type of hearing loss and it is permanent. With this kind of loss, some sounds come across at normal volume and others not all. Usually it’s low tones heard best with the higher frequencies missing. High pitches includes birds, bugs, timers, phones, kids and many women’s voices. In the alphabet many consonants are higher frequencies and vowels come across in low tones. Out of 26 letters in the alphabet, I hear five of them best; even with my hearing aids in. Imagine going through your day hearing mostly vowels and only some consonants clearly. Many conversations are a constant puzzle to piece together. Take the sentence, “I’ve got to get my keys,” and try understanding it this way: I ot et I ee’s. For those with hearing loss, their mind races to fill in the blanks much like Wheel of Fortune with letters blanked out. Life becomes the Wheel of Fortune, only can I buy a consonant, please? The vowels aren’t as important. My hearing aids help me get a few more sounds but I still miss whole words. A busy day of ‘hearing’ can lead to exhaustion with all that concentration and mental activity. Hearing people seem to think, “If only she would turn up the volume, she could hear.” Here it is in simple terms; volume distorts. Some sounds I hear well and some I do not. Take the word “shout” and try shouting it out. The “OW” hurts my ears coming across loud and clear but the “sh” and “t” are lost in “OW.” Shouting won’t work and neither will hearing aids with a super high volume because technology hasn’t caught up to missing frequencies. Mechanical hearing pick ups mechanical noises better than sounds I want to hear. I can’t hear my phone ring, my cat meow, birds sing and I have trouble understanding speech but I do hear the garbage truck grind to a halt in front of my house, the banging of the garbage bin as it’s tipped over and set back down. In cars, I hear road noise better than the person sitting next to me. In restaurants I hear fans, refrigerators and soda machines, not to mention the clashing of plates and clattering of silverware far better than the person sitting across from me trying to have a conversation. This also applies to large gatherings. All I hear is the roar of the crowd which drowns out the person in front of me trying to talk. Technology has come a long way and digital hearing aids have helped in that these noises don’t hurt my ears as much as they used to but I still can’t hear whispers, understand the television without captions nor lyrics in songs and I can’t understand what someone says from another room, even with my hearing aids in. Listening to people takes mega amounts of concentration. I use some lip reading, watch body language and facial expressions for clues and sometimes I still get stuck on a word or a whole sentence, even with the help of my hearing aids. I don’t leave the house without my hearing aids because without them I am more lost and every little bit helps. The old analog hearing aids were much harder to wear all the time because they turned up all the noise, including those I already heard well. The newer digital ones suppress some sounds and then try to take sounds I can’t hear and turn them into sounds I can but even that program has it’s limits. Eye glasses slip on and replace vision but hearing aids can’t do that. They help but they do not give me my hearing back. All the adjustments in the world will not replace true hearing. Please know I am tormented at my own failure to understand my native tongue, simple English. I come down hard enough on myself without others getting impatient with me. Once sounds are gone, they are gone and there is no magical cure. The other day we were heading to the post office. My boyfriend said something or another and I didn’t quite catch it. I asked for a repeat. He pulled into a parking spot and disappeared into the post office. He came back out smiling and asked if I had my FM system for the trip we were about to take. I told him I did, for once. Even on the defensive I felt guilty for not even having my hearing aids in to begin with. I really should automatically put them in every day. Sometimes being without all the extra noise is nice however. A toned down world can be less headache for me. Four or five days later he did the “remember” thing again tho I do not remember the situation (har-har). Where has this come from all of a sudden? He knows I can’t hear well so why the “REMEMBER?” I reminded him once again it’s not a memory problem (or is it, lol) but a hearing problem. It’s needing to make sense of the sounds I hear to make the word/sentence.